You may have noticed over the pages of this site, I am passionate about everything that is related to the bakery: I love making bread, pastries, maintain my leaven, etc.. 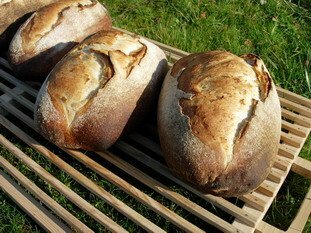 This page contains links to all the different parts of the site where we talk about bread: recipes, special pages, etc. I have been baking a cinnamon/sugar recipe called "Elephant Ears' or "Shoe Soles". They are a pastry similar to a palmier. They come out nice and crispy after baking about 6 or 7 minutes at about 400 degree in a convection oven. How can I maintain that crispy texture overnight? Unfortunately it's quite impossible, you can just reduce (a bit) the loss of crispy texture. 6 or 7 minutes at 400°F seems to be a short time, try to reduce temperature and increase time. Hi, I was trying to get your recipe for shoe soles. For some reason I can’t search it on your web page:(. Hi, I'm not sure to understand what is a shoe sole, sorry, and Google translate told me about real shoe only, I guess this not your aim? Would it be, possibly, a kind of flat pastry, made with puff pastry? If so, it could be this recipe : apple semelles (flat apple tarts)? Come back to me if I'm wrong.